Even in my final days in Hong Kong, there was still so much to do. Between tests, birthdays and sight-seeing, I packed in almost as much during one week as I had during the whole rest of the semester in Hong Kong. Don’t miss it! It was getting down to the wire for our semester long stay in Hong Kong to end, and because of that, everyone was getting even busier over there. We were all feeling the pinch, so we were trying to pack in as many activities as possible! The day after I last wrote, I had my second exam – at 8:30 in the morning! Ugh. The best I can say though is that it wasn’t a hard exam. I was totally prepared for it, and finished it in under an hour (we had up two hours if we needed it), but I was still glad it was over and done with. My last exam (which I was slightly more concerned about) was the following day at 4:30 and then I’d be FREE! I couldn’t wait to explore even more of Hong Kong, with no need to come back to campus and study. Woo hoo! Anyway, after my exam Saturday morning I studied hard for my next exam that afternoon because that night was my friend Abby’s 21st birthday and we were all going out to have dinner and then go clubbing with her. The restaurant she chose for her birthday dinner was actually the same Nepalese restaurant I’d had dinner at a few weeks prior. I tried to persuade her to go somewhere else (since I always wanted to try a new restaurant whenever possible), but she wouldn’t budge – ok, fine, it was her birthday after all. So thirteen of us arrived at the restaurant around 9 PM and because we were such a big group and it was such a small restaurant, it didn’t have room for us (even though Abby made a reservation). Therefore, the owner took us down one street to a bar called, “The Hidden Vine” and let us all order a round of drinks on him (he must have had some kind of a deal with that bar’s owner), after telling us the table would be ready in “10 to 15 minutes.” Right… 45 minutes later, Abby and a few others went up to find out about the table, and 15 minutes after that we were finally seated. 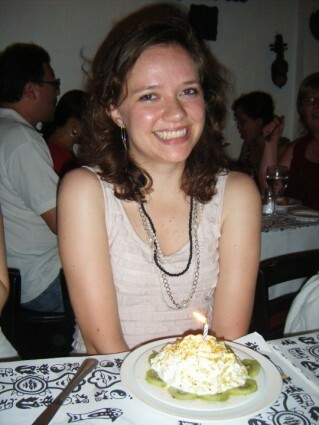 A very cute picture of the birthday girl. Now dinner was just as good as last time (this time I had chicken grilled in spices and spinach sauce), but since we were so many people, the owner said he would order rice and naan for the whole table. We all said, “Sure!” thinking nothing of it. Big mistake. When the bill came, he’d tacked on another $800 HKD ($100 USD) to the meal for all the naan and rice we had been planning to forgo before he “generously” offered to order for us. Damn it! Never let the management order for you – they totally ripped us off. But it was Abby’s birthday, so if she enjoyed it, it was worth the extra expense. After dinner, a bunch of people headed back to campus early because they had exams coming up on Monday or Tuesday that needed some serious study time (or they were leaving for Singapore in the morning to visit the boyfriend, which was Jen’s case). I chose to stay though, and we walked over to Oyster’s, chatted with other HKUST people (not nearly as many as on Thursday night), went to Beirut next where Abby had a new drink concocted for her in honor of her birthday, and finally everyone ended up at this bar on the 29th floor of the LKF Hotel (yep, there’s a hotel named LKF in LKF) dancing on the packed dance floor. I had worn my highest heels (in honor of Abby), and by the wee hours, my dogs were barking. Luckily, other people were ready to call it a night by then too. We hobbled down to the street, called Taxi Dennis (he drove exchange students around Hong Kong for reduced, flat fees instead of running the meter like normal cabs), and headed home after a pretty successful 21st birthday night. Although it wasn’t as much fun for me as Thursday night (we stood in the street just talking and drinking and not dancing for way too long), as long as Abby had fun, that’s what counted. 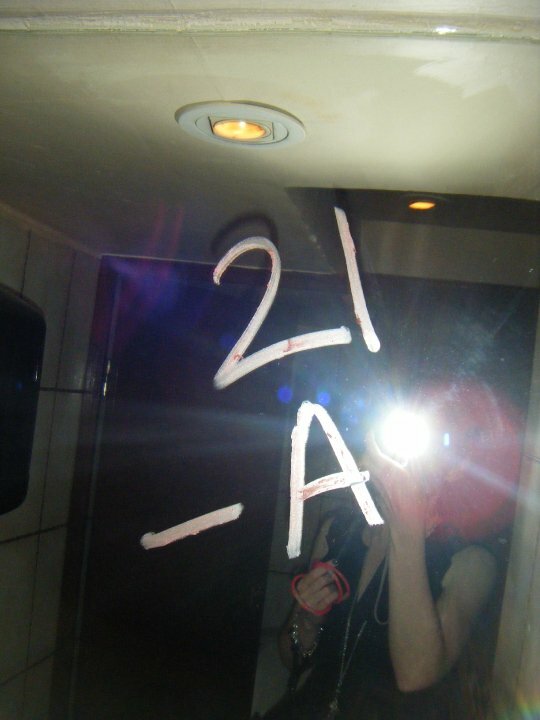 Abby left her mark on one of the bathroom mirrors during her wild birthday night. On Sunday, I went to the Chi Lin Nunnery, Nan Lian Park, and the Wong Tai Sin Temple with Erin, her boyfriend Mark who came in to visit on Thursday night from the States, and Mina. All three were really cool places! The nunnery and park were right beside each other and were both gorgeous and peaceful and perfect places for taking photos. And the temple (which I visited right at the beginning of the semester) was much less crowded this time around and we were able to enjoy it more. To top it off, the Boy Scouts of Hong Kong were holding some kind of a public safety fair, warning people against the dangers of drugs, alcohol and violence. So naturally, I now had a few photos of Chinese Boy Scouts, which looked almost the same as American Boy Scouts. Later that night, we went to have half-price sushi at this restaurant in Tsim Sha Tsui called “Egawa Sushi.” There’s a whole slew of sushi restaurants around the city that do half-price on predetermined sushi rolls after a certain time (usually not until 9:30 or 10 PM) but the one that we went to started half-price after 6:30. We went – and ordered more sushi than you’d believe! We just kept ordering more and more – sashimi, tuna, salmon, dragon rolls, dessert mango and strawberry sushi, sushi wrapped like ice cream cones, etc. It was all delicious! And we were actually full by the end (which almost never happens) when I’ve ordered sushi at a good restaurant in the past. To make such a great day even more perfect, we rode the Star Ferry (I swear I could’ve ridden that thing every day!) across the harbor to Wan Chai before taking the MTR home to campus. It was an excellent day all around. Stay tuned for my next blog. Getting closer and closer to the end gave me more energy and stamina to try to absorb as much of Hong Kong as possible. A much less formal hot pot outing happened, as well as a dinner date or two. Oh, and if that’s not enough to pique your interest, how about a completely diamond encrusted Mercedes-Benz? Yeah, I thought that might do the trick. 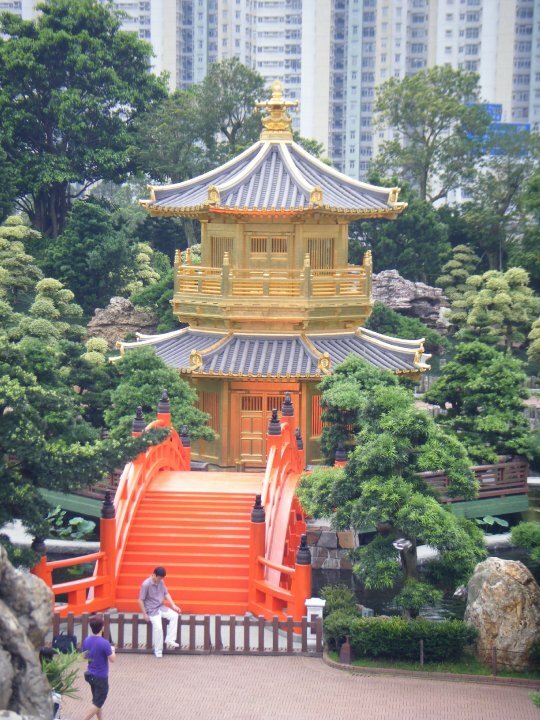 A pretty pagoda in Nan Lian Park. 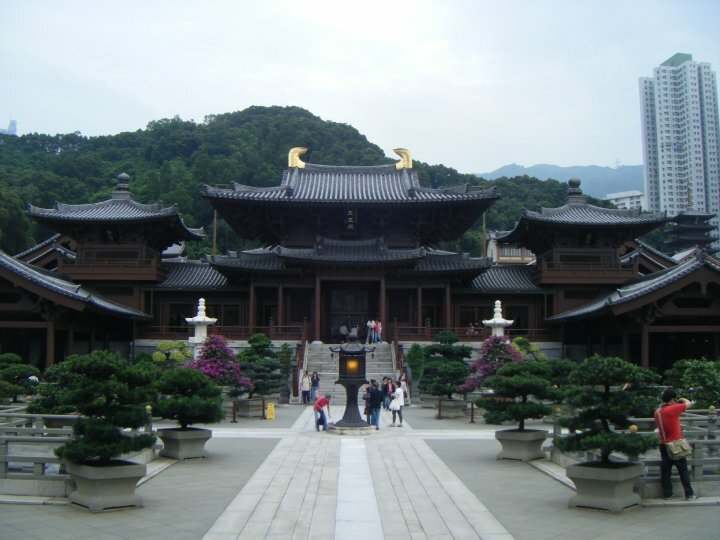 The Chi Lin Nunnery entrance. At a much more peaceful time of year than Chinese New Year. 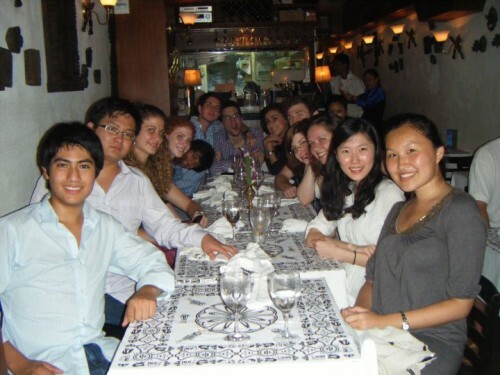 This entry was posted in Asia, Hong Kong and tagged Asia, Birthday, Chi Lin, Finals, Hong Kong, LKF, Nan Lian, Nun, sushi, Travels, Wong Tai Sin on May 12, 2014 by Paige N.. I am studying abroad in HK next semester! I’m so glad you found it! I hope you love HK as much as I did and hopefully this blog will give you some good ideas of what to see and do while you’re there!